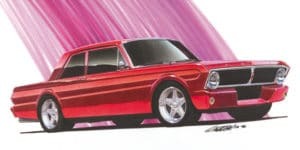 Falcon 2-dr sedan, resulting in this project car concept, with design features inspired by the Shelby GT350R. In 2001, Jim was given a 65 Falcon 4-dr and, thinking that the project might be more interesting on it, reworked the 2-dr design for the 4-dr. 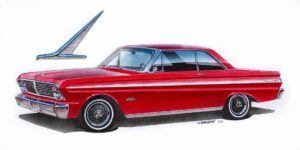 Both of these images have been in magazines recently, the red Falcon in Popular Hot Rodding, and the white Falcon in Hot Rod.